Apple is running new TV commercials for the iPad Air 2, the spots are called “Change is in the Air” and it appears there are at least two variations of the same commercial, one of which is embedded below. Each ad features a wide variety of people using the iPad Air for many different purposes, ranging from creating stop-motion animations, to recording skateboarding, using the iPad to help model and craft a surfboard, to helping to play music and much more. The new iPad Air TV commercials are backed by a peppy poppy punky song called “Who Needs You” by The Orwells. Many apps are used in the commercial, and Apple has conveniently created an accompanying website here for the commercial which shows the scenes from the advertisement and the app used for that portion of the spot. That’s pretty helpful since commercials can be a great way to see an app you might otherwise not know exists or may not ever see on your own. These new iPad Air TV commercials are quite different from the group of somewhat goofy iPhone 6 ads that are currently running, perhaps indicating a different target audience, or maybe they were just created by a different ad agency for the company. 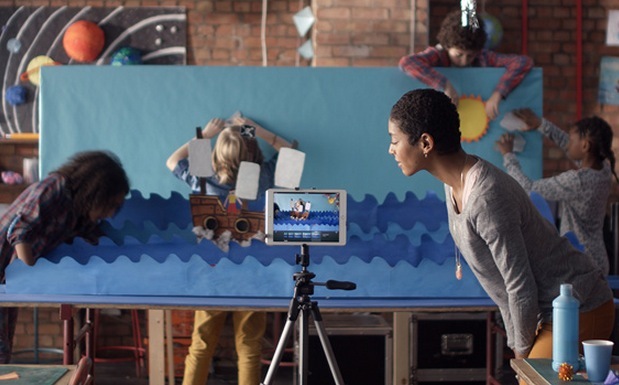 Many of the Apple ads and commercials are notably different, though these iPad spots are similar to prior commercials that ran for the tablet device.